With the ozone all but gone, the world is completely ravished and the temperature only continues to soar causing the oceans to rise at astronomical rates. Unprotected sun exposure is deadly in even the smallest amounts. To survive, most people have moved underground, like Owen and his father, but life isn't easy. Then Owen is selected for a month long camp under one of the domes built to simulate how life and nature used to be, and he counts himself lucky despite his worry for his father. Life seems easier for the people under the dome, but it holds it's own secrets and safety really is only an illusion. The creators have been searching for something, something ancient, and Owen may be the very key they need to find it. As revelations are made about exactly who and what he is descended from, he will quickly have to decide who to trust as the very fate of the world may just rest on his shoulders. The Lost Code starts out very slow, and aside from the event that set some things in motion, I felt like there wasn't any progress at all until the last third of the book. Granted, I do realize that most first installments in a series are a little slower than the sequels due to setting up the mythology behind the world. Even so, I have a feeling I wouldn't have finished this book if I had not have know from the description that it would center around Atlantis. I just felt like a lot of the stuff with the rest of the campers was unnecessary filler to the story. I would have much rather have had an expansion on the reason why the world was falling apart, or more of the Atlantean aspect. There was so much unfulfilled potential to have foreshadowed things more, adding to the suspense or mystery behind what was happening that I couldn't help feeling a little disappointed. There is a little romance in The Lost Code, but it didn't draw me in at it seemed two dimensional at best. I think a lot of that had to do with Owen's extreme awkwardness, and his inability to see himself clearly. I mean he had the queen bee girls fawning over him, so he has to be decent looking. I'm definitely not saying looks are everything, in fact in my opinion, they mean nothing compared to how a person acts. So I think his low place on the totem pole was really self-induced due to his lack of confidence. The actual love interest (name excluded to avoid spoilers) did seem to find Owen's behavior to be endearing, but the whole thing between them just seemed forced. Perhaps in time they will grow on me as a couple, but for now I can't help feeling rather indifferent towards the two of them. My two favorite legends in mythology are the Greek Gods, and the mystery behind Atlantis. 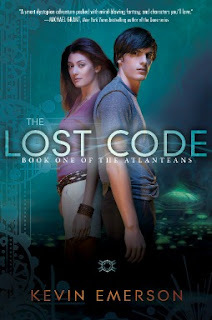 I've read several books with Greek aspects, but nothing to do with Atlantis, so I was extremely excited when I found out about The Lost Code, especially considering how great that description sounds. So, my expectations were probably a little high due to that excitement. Now that I've read it, I'm having a very hard time deciding how I felt about The Lost Code in the end. It isn't that I didn't enjoy the story, I did, there were just a lot of factors that caused me a good deal of frustration and disappointment. That being said, I have a feeling the next installment will be much faster paced now that it looks like the Atlantean aspect will be playing a much larger role in things. So in the end, I'm going to rate The Lost Code as a mediocre read, but a good foundation for the series, and hope the "wow" factor comes into play in the next installment.